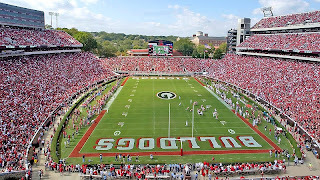 Georgia Sports Blog: Gold Smoke Appears: Pope Benedict XVI Ordains Notre Dame as "Alpha"
Gold Smoke Appears: Pope Benedict XVI Ordains Notre Dame as "Alpha"
Vatican City -- The college football world didn't see this coming. Most predicted Notre Dame's football team would start the season with a record of 2-6 or even 0-6. However, the improbable has happened. Notre Dame is now 2-0 with road wins over Pitt and Michigan. While fans across the country reluctantly expected to see Notre Dame race up the Polls due to the media's love fest for the Fighting Irish, today's events at The Vatican were even more shocking. "I am pleased to announce that myself and the entire College of Cardinals will be replacing the Harris Poll voters effective immediately," said Pope Benedict XVI. "I have claimed Papal Authority over this Poll based on the writings of Ignatius of Antioch, Cyprian of Carthage and Beano Cook." The Harris Poll was widely already maligned for having Ray Goff, Lou Holtz and Sandra Day O'Conner as voters. Pope Benedict, Successor to the Prince of the Apostles and College Football Expert, moved quickly to quell general fan nervousness about the legitimacy and built in biases of the new pollsters. "The first thing we want to make clear is that the Holy Roman Church will not be showing favoritism towards Notre Dame," said Pope Benedict. "For instance, we will not be unseating Southern Cal as the #1 team in America." His Holiness continued, "That isn't to say that Southern Cal sits a top our Poll. They are #1; however, Notre Dame is now "A". They are the Alpha team and will remain so until The Rapture or until a loss to Navy. Whichever comes first." Popular Cardinal Jorge Arturo Medina Estevez, who was once considered the front runner to replace Pope John Paul II, refused to speak with reporters following the announcement. Sources in Rome have revealed that the true reason that Estevez didn't win the April election for Papal ruler wasn't due to his Latino background. It was because he is a Miami Hurricane fan. St. Charlie Weis, new coach for Notre Dame, briefed reporters after Monday's practice. "Sure, the endorsement of the Supreme Pontiff of the Universal Church is nice, but really what did everyone expect? College football isn't hard. Every other coach is stupid, and I am a genius. Being named Alpha was something that I expected. We are Notre Dame. We deserve this." Damn, that was pretty funny. Nice work. Funny post. 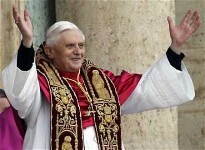 Didn't I hear (not really) that Pope Benedict was moving Weis ahead of JP in the beatification queue? Seems he said "Current miracles are more important than historical miracles." Media's love affair? More like love/hate, or an abusive relationship. 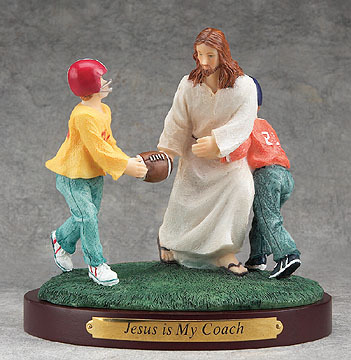 Pump them up when they're doing well, trash them when they're down (or when firing a lousy coach). Sure didn't seem like a love affair last December. Jeff - Good grief Jeff, you fired Willingham giving him virtually no chance to prove himself. Granted in retrospect it worked. But Notre Dame is going to stand up and tell everyone that they represent a "Higher Standard"...then expect the media to write about that higher standard...which the media has happily done for 100 or so years ....THEN Notre Dame needs to EXPECT to get the hell beat out of them by the media when they act just like everyone else. This is how the REST of us get treated when we do something slimy like ND did with TW. Even if it was dumb luck that it worked out.